I wanted to have a go at some embroidery so that I could make a greetings card out of it and today was the day as I wasn’t at work. How hard could it be? Well hard, and not hard, once you got the hang of it. 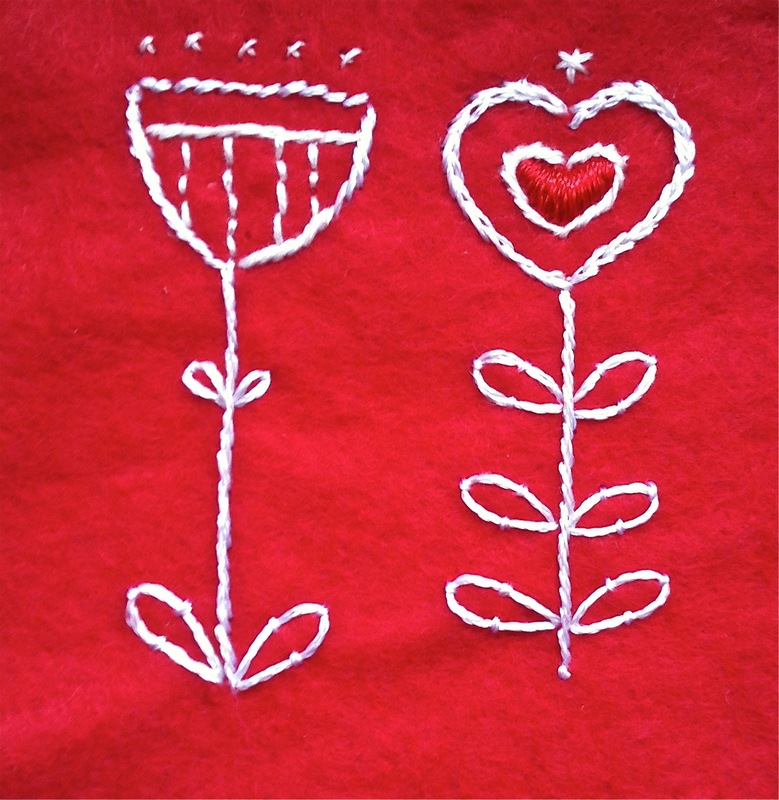 Continuing my Folk Art theme I wanted to keep it simple and use red and white (red felt with white embroidery thread) and in my head I seemed to think that producing something for Valentine’s Day is still possible – maybe for 2013! So I began by looking up some stitches on the lovely world wide web! Pretty easy as there are loads of websites with information on various stitches so first mission accomplished. The problems arose when I tried to follow the patterns – I am a lefty, you see, and all of the stitch illustrations were the wrong way round! That was until I found a brilliant website, well worth a mention, which gives a huge amount of pictures and instructions for more stitches than there could possibly be in the world – in a minute ago – as well as a great tip for us lefties – copy the image and then flip it in the image editor on your computer – mine is iPhoto and you just rotate the picture. Then it all made perfect sense. I (kind of) mastered chain or daisy stitch, split stitch, stem stitch and satin stitch, so not bad for a morning’s work and a first attempt! Tomorrow I am hoping to make a greeting card from the design – even though it is too late for Valentine’s Day this year and will also try to get another free machine embroidery picture started although it is way too cold for the workroom in Norfolk today! Red felt with white embroidery thread and red satin stitch in the small heart! I think you did good for a first try! YAY for you!!! Practice…practice and you'll be a master in no time.